May 1941. "Main street of Childersburg, Alabama." And a close-up of the restaurant glimpsed earlier from above. Medium format acetate negative by Jack Delano for the Farm Security Administration. View full size. Submitted by Alex on Mon, 02/11/2019 - 3:29am. The penny scale is a 1921 Mills Lollipop Scale, manufactured by the Mills Novelty Co. Chicago, Ill. Submitted by ColoZ on Wed, 02/06/2019 - 8:44pm. In Alabama in 1941, how welcoming the coffee shop was depended a lot on what you looked like. Submitted by Ice gang on Tue, 02/05/2019 - 2:43pm. how could those weight machines make enough pennies to even pay for their construction? From the same spot today. Submitted by kozel on Tue, 02/05/2019 - 2:17pm. It is not obvious from the picture but if you move street-view around the corner and look down the block, you'll see the same 2 story building as see in the "Local traffic: 1941" image that shows this corner. Submitted by JennyPennifer on Tue, 02/05/2019 - 11:02am. Ever since childhood, there haven't been too many two-word combinations that thrill me as much as "coffee shop" ... written or spoken, or even merely thought of, the words bring a tingle. Magical, the delicious aromas and scenes of comfort conjured by those words. Submitted by Alonzo on Tue, 02/05/2019 - 7:17am. The Delano pictures of Childersburg show a lot of new buildings going up in the main business district of time. The 30s-early 40s was not a time of heavy building in old southern downtowns, unless there is a military base nearby. So I took a look. A January 1939 tornado had taken a 100 yard swath out of Childersburg's business district. Submitted by archfan on Tue, 02/05/2019 - 1:18am. 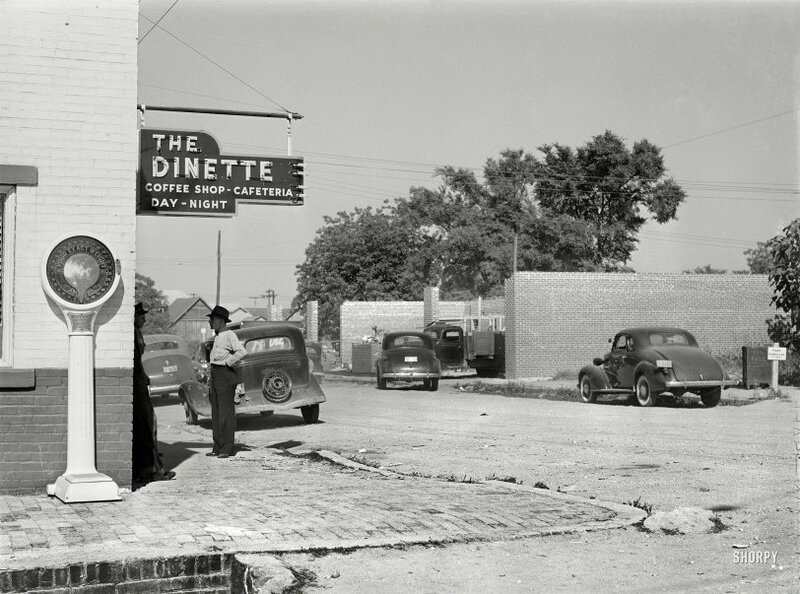 I bet I could get a great slice of lemon icebox pie and a sweet tea at the Dinette.